Some nights it is nice to have a few recipes that you can throw together quickly for a healthy meal. This is one of my favorites. Served together with sweet potato chips cooked in our Air Fryer and a pan fried lamb tenderloins with basil mint pesto sauce it is a delicious after work meal. Cut the broccoli into bite sized florets. Make sure to use the stem as well as this is the most nutritious part of the broccoli. Steam the broccoli for 7 minutes. In the meantime, heat the coconut oil in a frying pan and fry the garlic until crispy. 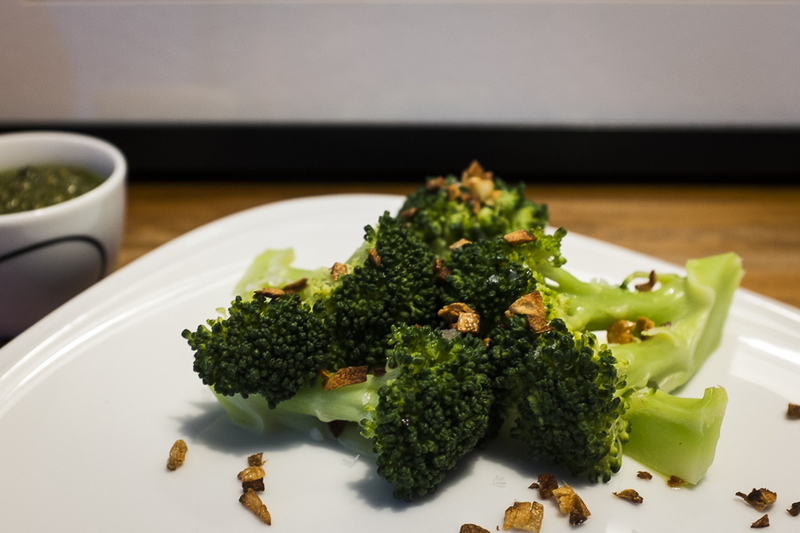 When the broccoli is done, transfer to a bowl, add a splash of good quality olive oil and sprinkle with the garlic, sea salt and black pepper.